‘Dark Matter’ is basically ‘Mass Effect’ without the magic. 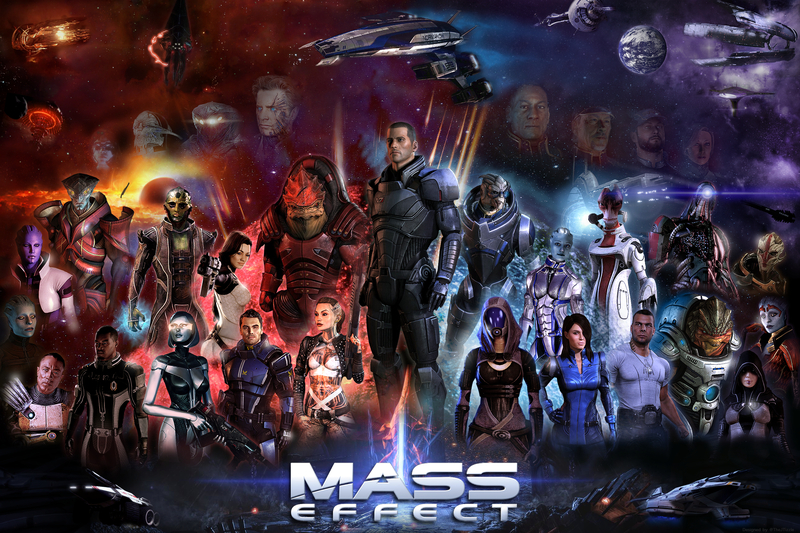 A legit Mass Effect movie or TV show probably won’t ever happen. Sorry, folks. Even if a Mass Effect movie did exist, it absolutely wouldn’t live up to expectations. The man they originally hired to hammer out a script, Mark Protosevitch, reluctantly admitted that there was simply too much content to turn the video game franchise into a working film. As for a TV show, there’s been no official discussion of one, no matter how badly people want there to be an HBO series. There is, however, Dark Matter: a show that just might scratch your Mass Effect itch while you wait to see what BioWare has in store for us in next March’s Mass Effect Andromeda. As Syfy’s space-faring drama Dark Matter eases into its second season, it’s becoming harder and harder to ignore the debt owed to BioWare’s sprawling epic. Sure, there’s no money in the budget for a lot of aliens or space magic, but if you’re searching for a space opera with a complex narrative, an existential bent, and a shadowy aesthetic, it doesn’t come much better. Okay, sure, in Mass Effect, the player character is clearly the star of the show by default. The game gains its real texture, however, from the lively band of misfits crowding the background and the drama that arose from sticking a bunch of dissonant personalities on a cramped space ship. Dark Matter is not only narratively in the same boat (so to speak), but they’ve even pulled a couple of solid character archetypes from the Mass Effect series. Robot exploring burgeoning human emotions? Check. Bio-engineered superhuman coming to terms with her abuse? Check. Ex-lawman trying to figure out if justice really exists? Dark Matter has that, too. In the opening moments of Mass Effect 2, Commander Shepard wakes to find that he (or she) has been ripped from the jaws of death in order to serve as the tip of the spear in a corporation’s quest to preserve humanity’s position in space. Of course, the Mass Effect galaxy is filled with more organizations doing nefarious deeds than you can shake a stick at. Dark Matter, too, is awash in the machinations of various corporate interests that use the cast and crew as hired hands, scapegoats, and puppets in order to further their own agenda. One of the most prominent features in the Mass Effect series is the title’s ever-present options. As players progress through the game, their Shepard meets and interacts with a wide variety of creatures and people scattered across the stars. Branching dialogue options allow you to make decisions that have very real implications for the story. In later iterations of the title, the impact of these decisions often had a way of rippling until — by Mass Effect 3 — your decisions in the first game had become something completely unexpected. In Dark Matter, the crew of the Raza is confronted with the results of the actions they’ve taken in their previous lives, actions they don’t remember but that still demand their attention nonetheless. (And let’s be honest: that same thing happens countless times while playing through ME due to the sheer fact of how long it takes to complete the trilogy.) In other words, the crew of the Raza are spending most of their time learning from and dealing with the repercussions of their past choices. Bouncing from space stations to research facilities to intergalactic prisons in order to survive a threat that’s dogging you at every turn sounds like the basic premise for pretty much every Mass Effect story ever. It’s also the basic plot line of Dark Matter, which finds the crew of the Raza doing their best to scrounge up a living at the fringes of the Universe. What’s more, Dark Matter’s general aesthetic is the same kind of neon-tinged homage to the grand sci-fi of the 1980s. From immaculate, brightly lit estates to a series of grungy clubs that pulse with the same techno heard among the seedier areas of Omega. Though its adventure is decidedly different from the Universe-saving nobility of Shepard’s saga, those people who have been waiting patiently for a Mass Effect series that likely won’t come might gain a little solace in watching the Raza’s crew atone for their past sins.